Why are Interviews so Hard? 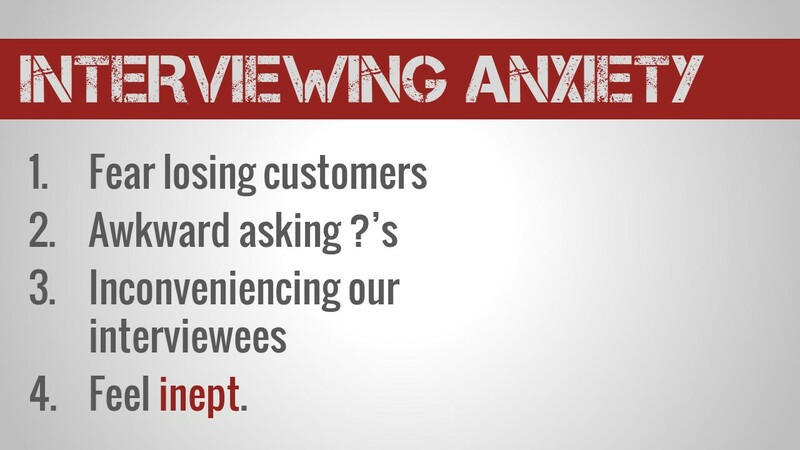 For a lot of people, customer interviewing can be a nerve-wracking and anxious endeavor. I’ve found that there are a few common reasons as to why most of us experience this anxiety. In this post we’ll discuss those common reasons, why we experience them, and how you can overcome them. It’s hard to actually get someone to agree to do an interview, so the last thing you want is to mess up your one-on-one conversation with them. The fear of embarrassing ourselves in front of someone we hope eventually turns into a paying customer, makes all of us anxious. It can feel really awkward trying to balance having a real conversation with someone while also trying to follow a script, and not break any of the interviewing rules. You’re getting so much out of these interviews, it’s natural to feel as though your interviewees must be giving up something. It can feel like you’re taking up too much of their time asking weird questions, especially when there’s nothing tangible they’re going to walk away from the conversation with. Your customers are using a bunch of language and jargon you don’t understand all while you’re fumbling with your next question. The whole thing can make you feel a little…clumsy. The first step will be very simple step and as you feel more comfortable, you’ll get closer and closer to what to interviewing a real customer. By the time you’re done with this approach, you’ll replace that clumsy feeling, with one of confidence. 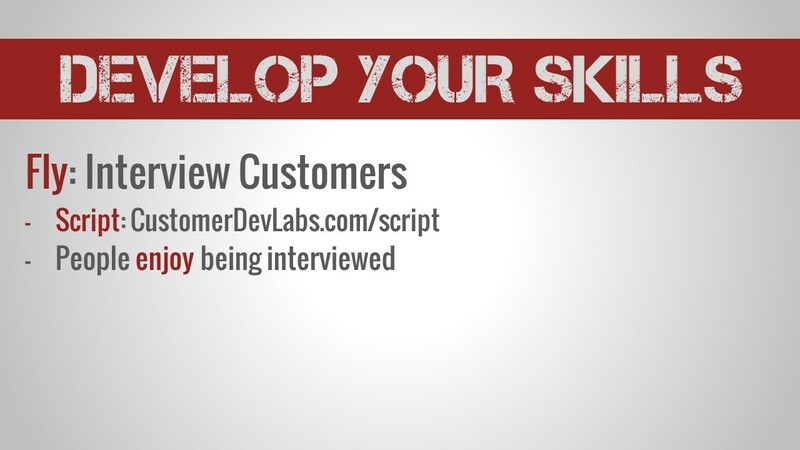 Before we get started: Take a look at the Ultimate Customer Interviewing Script that you can use when it’s time to interview your customers. It will give you an idea of what you’re going to ask your customers when the time comes to interview them. After you look at that script it’s time to do the Crawl phase of developing your interviewing skills and increasing your comfort level. Start doing “partner” interviews with someone close to you on a daily basis. Your “partner” could be your business partner, your life partner, your housing partner (e.g. roommate), etc. anyone you see on a daily basis. Ask about all aspects of their day, but be sure to focus the bulk of your attention on the challenges your partner is experiencing on a daily basis. Ask what the hardest part of their day was. Was there anything tough about work today? Anything hard with the kids? Dig deep into what is challenging them and see if you can elicit some emotions about those challenges. Imagine yourself in their position and relate how you would feel to the emotions that they’re experiencing. Your goal here isn’t to offer a solution right there and then. Your goal is just to listen, hear their problems and hear the words they’re using to describe those problems. Another technique is to focus on asking five questions in a row during this conversation before you answer any. Don’t get pre-occupied with counting the number of questions you ask, but this idea can help you set the intention to really focus the attention on your interviewee. Remember now is not the time to offer solutions. Once you’re comfortable with “partner” interviews, say after practicing it for a week or so on a daily basis, it’s time to take a walk. During the walk phase, you’re going to expand the scope of people you interview to include your friends and family. Through casual conversations that we normally think of as “small talk”, take the opportunity to ask the person you’re chatting with about the hardest part of their job, or the hardest part of their daily routine. This type of questioning will help you focus in on their challenges, and then once you’re talking about their challenges, get curious. This will help you make an emotional connection with your interviewee. Again, when you’re connecting at the emotional level, you’re starting to really understand the perspective of your customers. Finally, you’ll want to ask what they’re doing to try and solve this challenge. Remember, this is not your opportunity to solve the problem, but to simply ask them what steps they’re taking. This is going to get you ready to start asking questions about your competitors. 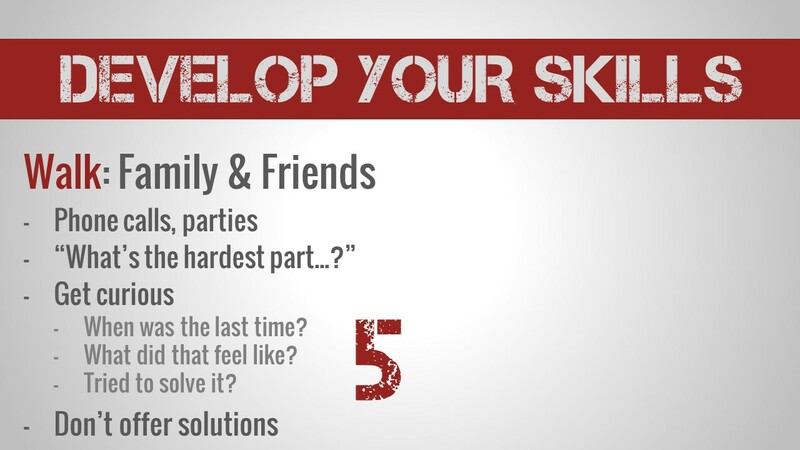 Concentrate on asking five questions before being asked any. – Don’t worry about counting the questions: Just make an effort to ask more questions than you answer and listen more than you speak. Use this as an opportunity to restrain yourself. – You’re going to have solutions: But you really need to practice not offering them. If you really think you have something that could help them, great! Just don’t mention it during that conversation. Wait a couple hours or a couple days and then offer them the solution. During this phase it will become second nature for you to ask about people’s challenges and become genuinely interested in them. In fact, you’ll notice that only will your “small talk” conversations become generally less awkward, you’ll find they’re more fun and rewarding for you, and the person you’re talking to. This habit of being interested in other peoples’ problems you’re forming will eventually free you from to feel tied to a rigid customer interviewing script down the road. You’ll feel more comfortable interviewing customers because you’ll have found a genuine, low-stress way to have a conversation with them. After you have a half-dozen of these conversations, you’ll have “walked” your way to higher quality interviewing skills. Now, it’s time to start running. Here you’re going to really put what you’ve learned to use. Start by going to a local meetup or startup event, and begin asking the questions that are on the customer interview script. These are largely the same questions you’re going to ask during your actual customer interviews, but with people who only feel like your actual customers. That way, you can be as awkward as you want, without you having to worry about losing a customer. Ask about the last time they encountered that problem. Understand both when it happened and what happened when they encountered that problem. Ask about the solutions they’re trying and what’s not ideal about those solutions. By this point you should be able to rattle off 10 questions or so before anyone asks you anything. This is because you’re getting comfortable with this approach but also because you’re talking to someone who is really passionate about their problems (they’re fellow startup founders). Don’t offer solutions during the conversation. Take notes about the problems that they’re encountering and follow up with an email the next day offering suggestions on solutions to their problem. 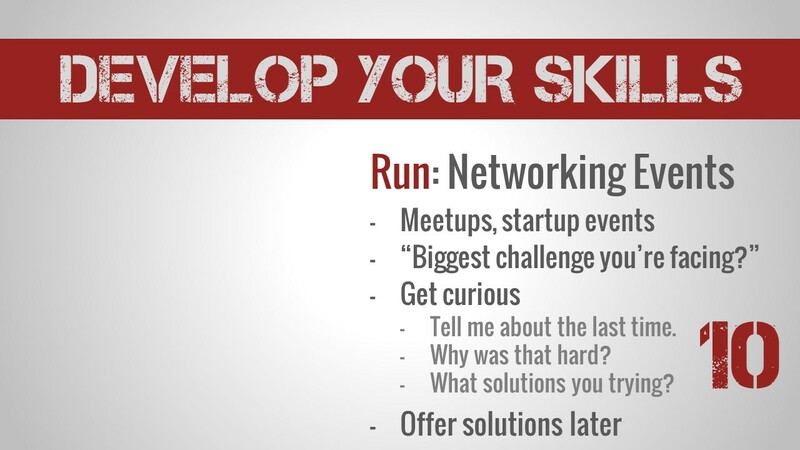 By the way, this approach to networking is the core of the Silicon Valley culture. Great networking is genuinely caring about connecting with someone else, and helping them. Not only are you building your customer interviewing skills, you’re building your network and networking skills as well. After you’ve repeated this process at two or three networking events, you’ve successfully crawled, walked and run your way to confident interviewing skills. Now it’s time to fly. Remember what it was like for your previous interviewees. People really enjoy someone genuinely connecting with them and being interested in their problems. You’re not inconveniencing them by genuinely listening to their problems. Check out the Interviewing Like a Pro exercise in the FOCUS Framework. This exercise is the 12th exercise in the 1st workbook in the FOCUS Framework. 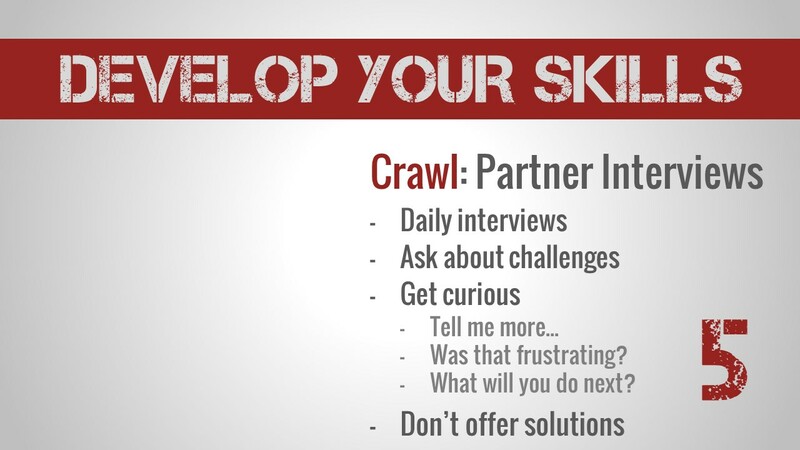 Now you know how to crawl, walk, run and fly your way to overcoming your customer interviewing anxiety. After having conducted dozens of interviews with non-customers, you’ll have developed your interviewing skills to the point that you feel confident and comfortable interviewing anyone, especially your Early Adopters. Justin, can you talk more about finding leads for B2B customer interviews?